GADZOOKS! Z-MAN was going about his daily business when several lines of strange and amazing poetry suddenly filled his mind. The first poem that Z-MAN received informed him that generations of children are being raised without moral and spiritual guidelines. Benevolent extraterrestrials wish to provide direction. Hello, dear friends, we're "out-a-sight"
And come from far away. GADZOOKS! 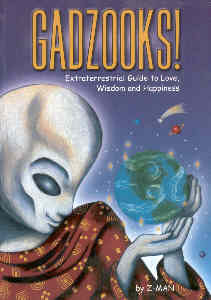 Extraterrestrial Guide to Love, Wisdom and Happiness is both playful and profound. It contains nuggets of wisdom that transcend cultural and religious barriers. Let fair play be your guide. * Teaches universal principles, including unconditional love, dignity, respect, self-esteem, a positive attitude, responsibility, and how to discover one's greater purpose in life. * Encourages virtuous self-expression and provides solutions to everyday human predicaments. * Is ideal for teenagers, young adults, and anyone else seeking answers to some of life's most important questions. "Today the postman brought Gadzooks! I dropped everything and couldn't stop reading until I finished. It is terrific, and the illustrations are charming." or call 505-983-1856 to order with a credit card. Bulk discounts are available. Inquire for details. Please contact Baker & Taylor, Ingram, or Midpoint Trade Books.